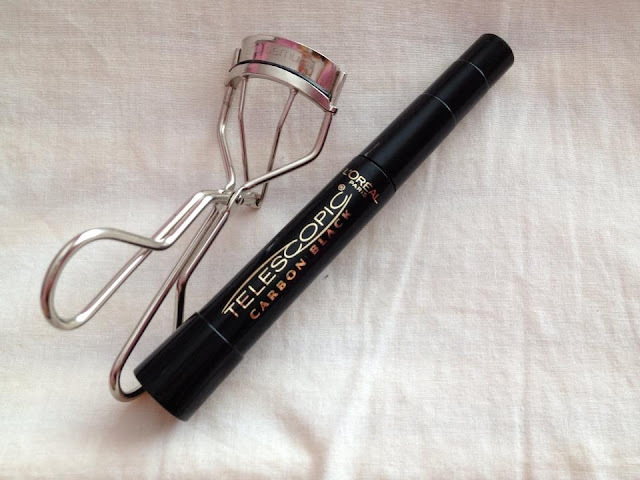 This is my favorite mascara, Its by L'oreal paris - Telescopic Carbon Black. Its by far the best one I've tried, even better than a lot of the high end ones. You can purchase this at any drugstore, and it goes for about $10. Best thing is they are always having sales on their products. Although I do prefer to wear false lashes when Im going out, this is what I do for a more casual look. What I do to apply: First I use my eyelash curler by Shu uemura. I start the mascara wand right at the base, and work my way up the lash. Make sure to fan them out. I do 3 coats for a fuller more dramatic look. Nice lashes ! Do you curl after you apply mascara as well ? I use the eyelash curler before, just cause I've heard after applying mascara its more likely to cause breakage.